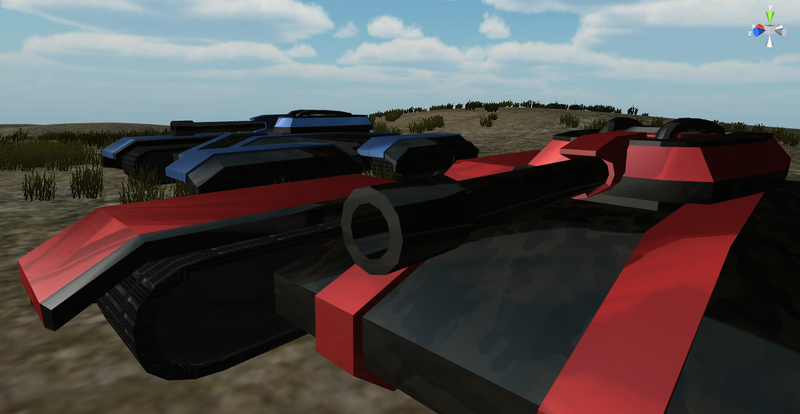 The red and blue next gen tanks. This is the next generation tank design for Carbon Combat. I created this model as sort of a demonstration for my colleague on Thanksgiving day (for the United States). The tank uses a classic futuristic quad-tread orientation that makes it highly maneuverable over light to moderately rough terrain. The cannon can rotate 360º around (though only about 160º due to the 3rd person camera angle) and approximately 60º up and down. Currently in the demo the tank only fires high-powered lasers. Some planned ammunition for the turret is explosive shells and plasma bolts. The secondary weapon will be a light mounted machine gun. To play the demo, please click the link below. You must have the Unity Webplayer plugin installed; you will be prompted to do so by the webplayer before it loads. See our Unity Webplayer page for more information. Controls: WASD or Arrow Keys to drive, mouse to aim and shoot. Dude... If you're gonna put in a freakin' tank, balance it with the other vehicles!! Make it slower, give it a lot of torque, and allow only two weapons - the explosive and the fixed light machine gun!